The Chocolate Church Arts Center—which originated as the Central Church—is one of two Gothic Revival Churches from the 1840’s in Bath. Each interpret the medieval style in a distinctive manner. One of those buildings is now operating as the Chocolate Church Arts Center on Washington Street. This facility, that began as the Central Church, has deep historical significance in the skyline of the city. In 1847, a young Boston architect, Arthur Gilman, was commissioned to design the Central Church, an impressive and sophisticated expression of medieval English architecture. The church stands on a Granite foundation and measures 47 feet wide by 88 feet long with a tower 18 feet square. This stately square tower forms the main entrance to a two and a half story wooden church with a large gable roofed sanctuary. The exterior is sheathed with board and batten and displays such Gothic features as buttressing, pointed arch windows and pinnacles. Its gable roof is ornamented with intricately carved bargeboards, and its door has large medieval hinges. Exactly how Gilman was chosen as the architect remains unknown but the fact that he designed the structure attaches a special importance to it. When Gilman planned Bath’s Central Church in April of 1846, he designed a modified wooden version of Upjohn’s Trinity Church. Central Church was one of Gilman’s first commissions and the only one of his career in Maine. The facility ranks as one of the most high style examples of wooden ecclesiastical architecture in Maine. It enjoys national significance as an example of its building type and as an early work of Arthur Gilman. The Central Congregational Church merged with the Winter Street Church in 1965 to consolidate the expenses of maintaining two large facilities. After the church was sold and everyone became members of the Winter Street Church, the Congregational Church took on a new purpose. The fate of the Central Church was uncertain and in jeopardy of being destroyed. Recognizing its architectural significance and in the spirit of supporting the cultural arts, citizens came together to create The Chocolate Church Arts Center. It received this name because of its unique chocolate brown color that covers the original caramel color it was before it had been painted white. Art transcends the box it is placed in. The Church stage is 36 feet wide and 18 feet deep and is spring loaded, making it especially applicable for dance productions. There are 277 fixed seats within a tiered, continental seating design. Additional seating can be added along the side balconies. The sound and light boards are located in an easily accessible cubicle. Both systems have been recently updated with audio-visual capability. Guests enter through the 170 year old double wooden doors to be greeted by the box office. The front lobby has space for concessions, merchandise and marketing displays. The facility is handicapped accessible through ramps to the side door, south of the main entrance. This building was added in 1853. South of the main stage, the art gallery, blackbox theatre and administrative offices are located in the Annex. 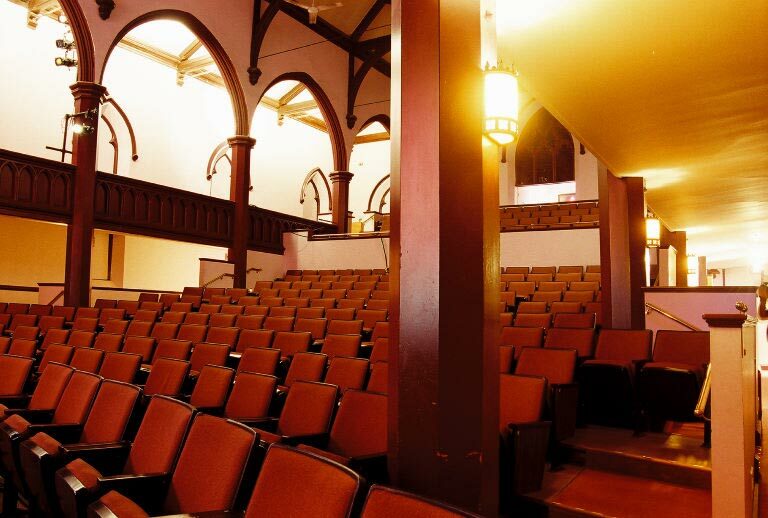 Among performing arts centers that operate year round, the Chocolate Church is unique in having a visual arts component. The blackbox theatre, with its own street-level entrance, is an ideal venue for smaller dance performances, theatre productions, musical shows or catered events. Seating varies depending on production and format. A basic kitchen, comfortable dressing rooms and bathroom facilities are also in this building.